National Accreditation Board for Hospitals and Healthcare or NABH headquartered in New Delhi is established in the year 2006 to grant accreditation and recognition to hospitals in India. NABH is a member of International Society for Quality in Health Care (ISQUA) which provides approval to Accreditation Bodies of any country. It has formulated certain standards for hospitals in relation to global standards set by ISQua. The hospitals or health care organizations recognized by NABH will have global recognition thus providing a much-needed boost to medical tourism. India is the 12th country to be a member of this organization. This standards consists more than 600 objectives which a hospital have to attain in order to get the NABH accreditation. These are classified between patient-centered standards and organization centered standards. To get the accreditation the hospital have to standardize all their activities right from registration, admission, pre-surgery, pre surgery, post surgery protocols, discharge from hospital etc. What are major standards a hospital has to follow? Med E Talks 2017 is organized by Anvita Tours2health Pvt Ltd a front runner in Internet Marketing in Healthcare. Based in Infopark Thrissur, Kerala, Anvita has been engaged in serving more than 200 plus hospitals, clinics and doctors across the country in the past 5 years. India has around 750000 doctors and another 30000 adding each year. Awareness about medico legal cases have become more important nowadays. So it has become very necessary for doctors to know about the matter and practice it. According to Section 39 of Criminal Procedure Code of India, each and every doctor must inform police at the earliest in case of any injury cases due to some criminal offense. This is done so the police can collect needed evidence at the earliest. Any failure on the part of the doctor is considered criminal offense and he/ she will face legal proceedings or have to pay compensation. After the patient is given necessary medical care doctor will inform the police about the matter immediately. If the evidence is given via phone a doctor's number is given to keep it as a proof and will be added to the patient's records. Once the patient is recovered he will be summoned to the medico-legal desk. Then the patient has to fill a form and put the signature in it. Police will then take the statement from the patient and confirm whether the patient wants to file the case or not. Later the person will get receipt containing file number and case number then he can employ a lawyer and take forward the case. Med E Talks 2017 is organized by Anvita Tours2health Pvt Ltd a front runner in Internet Marketing in Healthcare. Based in Infopark Thrissur, Kerala, Anvita has been engaged in serving more than 200 plus hospitals,clinics and doctors across the country in the past 5 years. 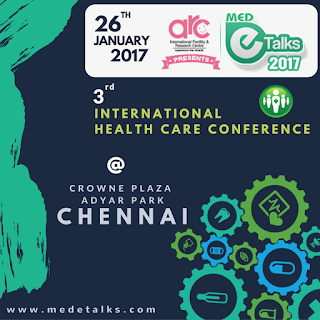 Medetalks 2017 is a medical conference that brings together experienced doctors, business honchos in healthcare, CEO's and marketing bigwigs from across India to ponder and brainstorm over how to practice management and visibility techniques for doctors, clinics or hospitals. This forum will help each participant on how to reach out to the right patient at the right time by using new age communication technology. Serving as the Group President for the Rainbow Hospitals Group in Hyderabad Mr. UK Ananthapadmanabhan is one of the longest serving professional hospital administrators in India since 1983. His business acumen and vast experience in marketing field catapulted him into the current stature. Prof. Dr. Ashok Thiakarajan is a marketing & management guru with 30+ years of experience in healthcare industry. He adorned top leadership roles in multinationals like Johnson & Johnson, Murugappa Group, Cipla, Beiersdorf A.G (Germany) and Kovai Medical center and Hospitals, across the Globe as Sales Manager, Brand Manager, Project Head and Vice President. Adding more laurels to that he is a regular invitee to conferences in prestigious B-schools and IIT's and other universities in India and abroad. Dr.Saravanan Lakshmanan is the Founder Chairman & MD of Abhijay Hospital / ARC International Fertility & Research center which is a known infertility hospital in Chennai. He received GOLD MEDAL in Embryology program from His Excellency, Honourable Governor of TN Dr. Rosiah. His career achievements are the testimony to the fact that miracles happen when passion and hard work come together. In the past one decade, the hospital catered to 100000 outpatients and done 8000 major surgeries so far. Hemant Radhakrishnan is a known tech entrepreneur who founded AnvitaTours2health, a business venture in medical tourism field. Prior to that he worked with Indiamart Intermesh Ltd, BPL Cellular, NEST BPO Services and gained wide experience. He received “ Pillar of Success” award in 2009-2010 for the performance in IndiaMart Inter Mesh Limited. He has great expertise in sales & marketing, business process outsourcing, client servicing, profit-centered operations etc. He is the founder director "Association of Healthcare Providers (India)" Dr. Gyani has more than 40-years of experience in the areas of Teaching, Research and Quality Accreditation. He has been popular speaker on Quality in healthcare at large number of the international events. Medetalks is organized by Anvita Tours2health Pvt Ltd a front runner in Internet Marketing in Healthcare. Based in Infopark Thrissur, Kerala, Anvita has been engaged in serving more than 200 plus hospitals,clinics and doctors across the country in the past 5 years. ARC Med E Talks 2017 a medical conference on New Age Healthcare Marketing and Management will be held on 26th January 2017 at Crowne Plaza, Chennai. This is a knowledge sharing networking platform which aims at creating awareness among medical professionals, management professions in health care sector about new trends, opportunities in health care industry. The event aims to bring together hospital owners, promoters and health care managers from different parts of India. ARC International Fertility and Research Center, a leading Infertility Hospital in Chennai is the title sponsor of the event. Med E Talks is organizing successfully for the third time after the huge success of 2013 Med E Talks and 2015 Med E Talks held at IMA hall, Kochi. The success and confidence that we gained from the previous two events help us to continue with this in the current year too. The encouragement and feedback that we gained from the previous year energized us to organize this year's event in a big way. The total market ambiance is suitable for the growth of the digital business sector in India owing to the business-friendly decisions taken by our government over the past few years. With the accessibility of Internet especially through mobile phones, people has increased its chances manifold. With low-cost medical options, experienced doctors combined with unexplored locales has in the way increased the influx of international tourists and patients into the country.